One of the great joys for Christmas for me each Advent is setting up my Christmas crèche scene. I always admired the richly dressed crèche figures that are popular in many Latin countries, and some years ago decided that I would try to have one of my own. 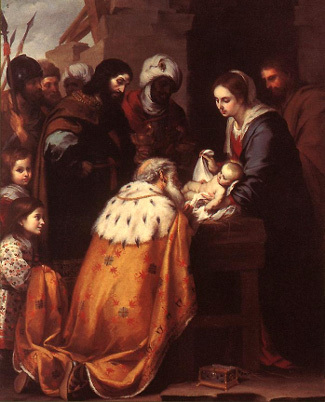 I started humbly enough, with three clothed figures, St. Joseph with his brown felt robe and sheepskin cloak, Our Lady in a rich sapphire satin gown and burgundy brocade mantle, and the Infant Jesus in a shimmering gold gown trimmed with silver. The figures stand about 7-8 inches high, and every year I added more pieces, so the ensemble has come to fill quite a large space. As the scene grew, my creativity expanded with it. 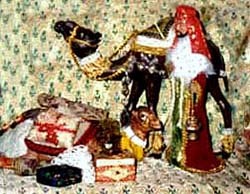 The shepherd boy has a silver studded felt drum with little sticks to beat it, the camel is outfitted with tassels, saddlebags and jeweled leggings, two peacocks with real feathers perches over the crib, and the Three Kings each try to outdo the others in the colorful spirit of the East with their richly brocaded gowns trimmed with ermine and the hoards of rich gifts they have brought to the King of the Kings. It is quite appropriate that the Three Kings should have ermine-trimmed cloaks, for the ermine is a symbol rich in meaning and depth. Deep calleth unto deep, as the Psalm says. 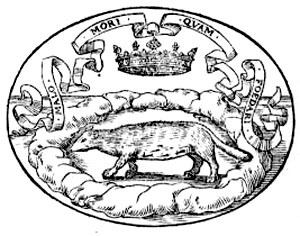 In this case, the ermine is a symbol with one layer after another of meaning, each one calling to the next with a more profound sense. Above, hunters have surrounded the ermine with a mud ring. When the ermine realizes it cannot escape without soiling its fur, it surrenders itself to the hunters. A banner above it says Malo Mori Quam Foedari - I prefer death to defilement. Because of its pure white fur the ermine became a symbol of moral purity and innocence. Even more marvelous, the medieval bestiary tells us, is that the ermine, with its beautiful white coat, would rather die before soiling its fur. According to Aelian, the ermine, falling into a mud puddle, would immediately die of sorrow. Legend has it that hunters seeking the highly prized fur of the small animal would smear the entrance of its lair with mud, then begin the hunt. Tired and exhausted after a long chase, the ermine would flee to its home, only to find the mud on the entranceway. Rather than sully its coats by running through the filth, the ermine would give itself up to the hunters and dogs who had followed it. Thus the ermine became associated with phrases such as Death before Defilement, and Death rather than Dishonor. This, then, is the marvelous symbolism of the ermine. With it we return to our Christmas crèche. Obviously, the purity, innocence, and nobility of the ermine is symbolized in its highest degree in the Christ Child, the most pure and noble of all beings. There is another layer to the symbolism: because the ermine’s coat turns brown in the summer, the ermine seems to die and then be reborn in the winter. Therefore it also stand’s for Christ’s Resurrection. If we drop a step, we find this purity and nobility represented in a superlative way in the chastity of Our Lady, a Virgin before, during and after the birth of Our Lord. Ermine is represented by a white field with black spots in heraldry, left. It is also a regal fur, long used on the robes of royal and noble persons, right. Dropping another layer - this time the step is longer - we find our Three Kings, who represent the valor, nobility, virtue, faith and Christian grace characteristic of the nobility in a Catholic society. For this reason, the ermine’s fur was attached to the robes and cloaks of royalty, nobles and dignitaries, including the Princes of the Roman Catholic Church, as a reminder of the valor, justice and dignity their offices require in motive, discipline, behavior and teaching. A white field with black spots – the spots representing the black tipped tails of these small animals - also appeared on the coats of arms of knights as a sign that they would prefer death rather than to stain their honor and conscience. We drop again, and this time we find ourselves before the crèche. Seeing that pure white ermine and knowing what it represents, we are reminded to imitate the innocence of the Christ Child, the purity of Our Lady, and the valor of the knight. Like the ermine that prefers death to defilement, we should be ready to die rather than commit a mortal sin, sullying the whiteness of our souls with the deadly stain of sin. Further, we should be prepared to perform the most heroic deeds and suffer the greatest hardships, including death, rather than suffer stains to the reputation of Christ’s bride, the Church, or see sullied any of the tenets of its immutable and magnificent teaching. All this invites us to the fight of our days in a double sense. First, today we fight against the filth of a secular world that is giving citizenship to every kind of immodesty, immorality, and aberration. We suffer a worse shock to witness the pedophilia and homosexuality scandals of the clergy and even high Prelates of the Church, those who should represent purity of behavior in its highest degree. What is our prayer before the Most Pure Infant at the crèche? That the purging and avenging sword of God might fall to cleanse what belongs to Him if the authorities fail to act. And that this happen soon. Death before defilement. Second, since Vatican II we have seen the perennial doctrine of Holy Mother Church defaced, her magnificent altars dismantled, her sacral customs abandoned, her holy devotions scorned and laughed at. Our prayer is simple before the crèche: Give us the courage, prudence and audacity, Our Lady, to defend the honor of Thy Son and His Holy Church. Give us the nobility of soul to take up the banner of orthodoxy and fight for it, willing to give our very lives if necessary for so high a cause. Death before dishonor. These are the thoughts inspired by the beautiful symbolism of the ermine as we stand before the crèche this Christmas, 2003.